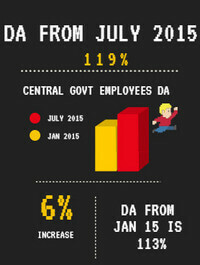 Eligible DA from July 2015 is 119% – All India Consumer Price Index for June 2015 released by Labour Bureau – 3 Point increase in AICPI (IW) from 258 to 261. The All-India CPI-IW for June, 2015 increased by 3 points and pegged at 261 (two hundred and sixty one). On I-month percentage change, it increased by (+) 1.16 per cent between May, 2015 and June, 2015 when compared with the increase of(+) 0.82 per cent between the same two months a year ago. The year-on-year inflation measured by monthly CPI-IW stood at 6.10 per cent for June, 2015 as compared to 5.74 per cent for the previous month and 6.49 per cent during the corresponding month of the previous year. Similarly, the Food inflation stood at 6.67 per cent against 5.99 per cent of the previous month and 5.88 per cent during the corresponding month of the previous year. At centre level, Quilon reported the highest increase of 15 points followed by Godavarikhani (9 points) and Raniganj (7 points). Among others, 6 points increase was observed in 4 centres,S points in 9 centres, 4 points in 11 centres, 3 points in 8 centres, 2 points in 15 centres and 1 point in 11 centres. On the contrary, Ghaziabad centres recorded a maximum decrease of 2 points. Among others, I point decrease was observed in 6 centres. Rest of the 10 centres’ indices remained stationary.